—David Lynch on most of his movies. David Lynch is a widely acclaimed and influential director of film and television. Like Alfred Hitchcock and Akira Kurosawa, he was originally trained as a painter. He made a short film called Six Men Getting Sick, which won a cash prize. From this point forward, he would be a professional filmmaker. Some of the obvious influences on his films are Federico Fellini, Billy Wilder, The Wizard of Oz, 1950s pop music, Tod Browning and Luis Buñuel. Some of his frequent collaborators include Kyle MacLachlan, Laura Dern, Isabella Rossellini, Angelo Badalamenti, and the late Jack Nance. If you watch one of his works, expect some type of severe head trauma to play a role. Also, pay close attention to use of white noise and ambient sounds. Kunihiko Ikuhara wants to collaborate with him some day. Their powers combined will pierce the heavens. The Straight Story -- Wait for it... a G-rated Disney movie. Has a coherent plot and everything! Alan Smithee - For the long version of Dune. Arc Words - There is not a single David Lynch film that doesn't depend on the use of repeated cryptic phrases to set a spooky or dreamlike mood. Big Ol' Eyebrows - The Mentats in Dune. And, indeed, Lynch himself. Cloudcuckoolander - Lynch is certainly one of these. Mel Brooks once described him as "Jimmy Stewart from Mars." He also has a Twitter account. He posted twice about finding out whether he's connected to the moon and three times about buying an ax. Daylight Horror - He sometimes likes to set scary moments during daylight hours, often in normal, suburban locations. See, for example, the Winkies scene in Mulholland Drive. Death of the Author - Lynch himself enforces this. Directing Against Type: The Straight Story is a sweet, gentle movie about an elderly man who travels on his riding lawnmower visit his estranged brother. It actually does bear a lot of the subtler trademarks of Lynch's direction, though. Dying Dream - Mulholland Drive. Or is it? Emerging From the Shadows - Often seen in his films. The Fifties - None of his works are actually set in the fifties, but most of them are visually and thematically very clearly influenced by the era. Gainax Ending - Most films by David Lynch lack a comprehensible ending, including Twin Peaks but excluding the aptly-named The Straight Story. Louis Cypher: some of Lynch's creepiest characters, such as the Mystery Man, the magician in "Silencio" and (possibly) the Cowboy are heavily implied to be this. Magical Realism: Most of his films fall into the genre in some way or another. Some are realistic but extremely bizarre (Blue Velvet, Straight Story) while others go into the realm of pure fantasy (Twin Peaks) and beyond (Eraserhead, good god, Eraserhead...). The rest are, well.... somewhere in between. it's not like we can really be sure or anything. Mind Screw - Mr. Lynch is a mental Lothario. Wild Mass Guessing, however, is put on another scale of existence. Nightmare Valley - Some of his commercials, and Michael J. Anderson's role in Mulholland Drive. Ostentatious Secret - Mulholland Drive has a mysterious blue box, which has a matching blue key. It is shown to open once or twice, though the Mind Screw makes it hard to tell what if anything is going on. Production Posse and Spiritual Successor - Many of his films share themes, crew, actors and occasionally even characters. Word of God is that Lost Highway and Twin Peaks are in the same universe, which raises a few questions about the roles of Jack Nance and David Bowie. Scare Chord - He is really good at these. 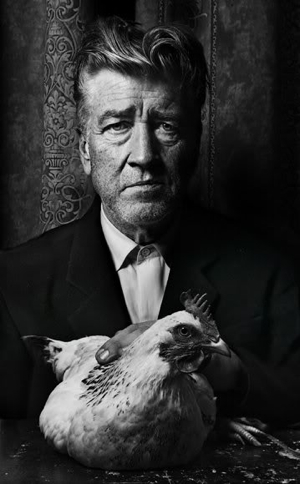 Shrug of God - Lynch flat refuses to explain his movies, and that goes times ten for how he made Eraserhead's baby. Sliding Scale of Realistic Versus Fantastic - Fucked with. Brutally. Tomato in the Mirror - part of the plot of Mulholland Drive, maybe. This page was last edited on 17 September 2017, at 19:53.